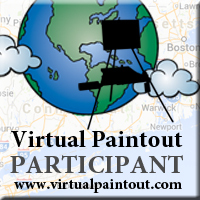 Happy Paint Party Friday! I’ve been painting all week on my junk mail book for Carla Sonheim’s summer camp and it is almost finished but the last lesson is today so I’ll show that in the next couple of days. These are a couple of ATCs I painted this week for an Elegant Animal People themed swap at Illustrated ATCs. It’s 3 for 3 so I need to do one more. I haven’t done ATCs in so long! It will be fun to trade again. This entry was posted in Arts & Crafts and tagged ATCs on August 19, 2011 by admin. Oh wow..these are super fabulous..such enchanting charming souls…fantastical work…beautiful!! Oh how delightful – I love seeing these animals – you did a great job creating pure legance! Fun, whimsical, entertaining – great job! Frightfully elegant and sophisticated. I wonder where they shop?? HOW FUN! Love the colorful characters! Oh these are indeed elegant! Wonderfully done! I love those elegant animal paintings, especially the personalities. Love the ATCs! I’m not a fan of lizards but you sure made him look dashing. Oh my gosh these are so much fun! They are both so, so cool – I can’t wait to see the third! These are great. The both look so sophisticated and dressed so well. Tee hee. They are just darling! Love them. Happy PPF and thx for sharing. Oh, these are terrific! Love them both, but the lizard is my favorite. these are wonderful, very sophisticated animals!!! I really like the hippo lady – she has a lot of attitude (which I don’t mean in a negative sense here). Love these elegant animal people – they are so full of personality & character. Fab!! These are really wonderful, so creative, love them! Wow these are a couple of really creative characters!! Love them! Good job!! I also like these a lot! boy oh boy, do I love those! 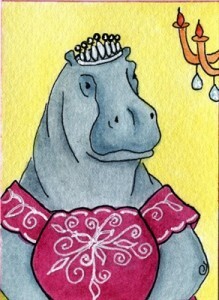 That giant hippo in the dainty tiara with her hands demurely crossed in front of her just outside the frame. She has so much dignity. I can’t get enough. Hope you post a picture of the third one you do for the trade! 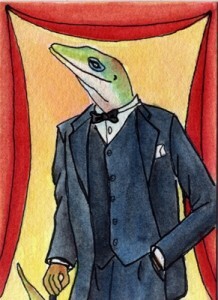 Just wanted to let you know I did post the third Elegant Animal ATC on my blog today. These are adorable!!! I think you need a little story with those two. Very cute! These are so imaginative and fun!!! Great works and you can’t beat that they are ATCs! HAPPY PPF! Your elegant creatures are absolutely divine!